1. Cosimo’s impressive military expansionist politics required an ambitious programme of fortifications and the reorganization of armed forces on land and at sea in order to control the commercial traffic in the annexed territories, which extended from Arezzo, Siena and Pisa to the Mediterranean coast and the Stato dei Presidii. 2. “[B]ecause, just as those who draw landscapes place themselves below in the plain to contemplate the nature of the mountains and of lofty places, and in order to contemplate the plains place themselves upon high mountains, even so to understand the nature of the people it needs to be a prince, and to understand that of princes it needs to be of the people.” See Niccolò Machiavelli’s “Dedica” in Il Principe (1513); the English translation consulted here is The Prince (London: J. M. Dent & Sons, 1958). Referring to the disunion between the plebs and the Roman Senate in his Discorsi sopra la prima Deca di Tito Livio, Niccolò Machiavelli contested the traditional cult of civic concordance by asserting that conflict and turmoil were a necessary foundation for and driving force of state power. A healthy republican institution had to derive, in fact, from the resolute and dynamic opposition of its constituent parts, and not from their steady reciprocal equilibrium. In this sense, a 16th-century city aiming to extend its hegemony over neighbouring territory like Florence had to rely on both the faithful support of a popular army and the art of government of its prince, whose virtuosity was supposed to be focused on controlling the intestinal humores of the newly conquered provinces through the measured deployment of defensive and managerial institutions. Therefore, apart from military fortifications, whose development paralleled innovations in the technology of firearms, one fundamental form of the Renaissance utilitarian architecture was the construction of office buildings and administrative apparatuses in response to the emerging forms of immaterial production and capitalist accumulation, such as banking, insurance enterprises and trading and forensic activities, which demanded a calculated spatial relationship between the expansion of the state’s dominions and its managerial infrastructure. As a result, the archetype of the loggia, meaning an open-sided roofed or vaulted gallery that is either freestanding or positioned along the side of a building, proved to be the most effective device for mediating between severe office architecture and its surroundings. In the vocabulary of the urban forms, in fact, the loggia can be considered as the opposite of the city wall: it does not include or exclude anything, but rather creates a space in which to frame and “measure” people, movements and goods, thereby modifying the very contextual conditions in which it is placed “from within” as a sort of internal threshold. An office structure with a loggia thus presented a perfect synthesis of the two main types of power: the political and the managerial, or the representativeness of the State and the effectuality of its governance. According to this logic, Giorgio Vasari’s Uffizi in Florence and his Loggia in Arezzo could be considered as two exemplary projects that effectively combined the seriality of the office building with the open permeability of the loggia in a unique administrative framework in the context of the economic and political renovatio that was carried out by Cosimo I de’ Medici from 1537 to 1574 and that transformed Florence into the capital of a new state, the Grand Duchy of Tuscany. Cosimo, who had inherited the ingenuity and sharp obstinacy of his father, the renowned condottiero Giovanni dalle Bande Nere, primarily used architecture as a strategic political instrument in order to replace the obsolete communal institutions with modern managerial infrastructures. As if on a battlefield, he carefully positioned an archipelago of monumental interventions to order and shape the city’s mediaeval urban fabric according to the main routes of trading businesses and production. The plan was implicitly evident already in 1540, when Cosimo moved his residence from the Palazzo Medici on Via Larga, to the old Palazzo del Popolo in the very heart of the historical city, symbolically validating his new political project by aligning himself as heir to the republic’s glorious communal past and consolidating his regime around the Piazza della Signoria, the epicentre of the Grand Duchy. As Machiavelli asserted, power is inseparable from its subjects, and it is only by assuming a popular perspective that it becomes possible to truly understand the nature of the prince and of his mandate. Cosimo always perceived reality as the unstable product of fluctuating relations, with their continuous and unpredictable overturns and shifts; his reality could only be confronted dialectically by understanding the political cartography of its conflicts and acknowledging the claims and deepest exigencies of its subjected population. For these reasons, when the state achieved a critical dimension after the annexation of Siena in 1555, Cosimo carried out its general economic reassessment, beginning with a careful analysis of its productive forces. He then ordered a general territorial survey of the Duchy, with a detailed investigation of its natural and human resources, including a statistical census of its inhabitants and their professions. He also issued a series of important fiscal and legislative reforms, reducing the autonomy of guilds, individual craftsmen and peripheral local powers and placing them under the jurisdiction of his centralized government. Along this line, in 1549 he ordered a progressive rationalization of the state administrative apparatus, which began with the Capitani di Parte Guelfa, who were made responsible for Florence’s public works, and culminated between 1561 and 1563 with the unification of all of the single magistracies in a single office building (uffizi) intended for the publicae commoditati (common good), a sort of forum which had to be built at their own expense and through the heavy taxation of Florentine citizens. Besides Bramante’s tribunal palace in Rome, or the Castel Capuano tribunal court in Naples, there were no typological predecessors for such a building, whose purely administrative function did not require any symbolic or flaunted authority, but a rather strict economy of means and a minimum impact on the historical urban fabric. Cosimo, in fact, rejected the first free-standing, palace-like proposals,3. Vasari’s first proposal for the Magistracies was redrawn in plan by his nephew, Giorgio Vasari il Giovane, who developed the governmental office typology even further in his projects for a Tribunal and a Customs House; see Andrew Morrogh, Disegni di architetti fiorentini 1540–1560 (Florence: Gabinetto Disegni e Stampe degli Uffizi, 1985), cat. nos. Uffizi 4881A and 4858; see also Giorgio Vasari il Giovane, La città ideale, ed. Virginia Stefanelli (Rome: Officina Edizioni, 1970). For the projects for government offices and public buildings by Bartolomeo Ammannati, see La Città: Appunti per un Trattato, ed. Mazzino Fossi (Rome: Officina Edizioni, 1972). For a general account on Giorgio Vasari, see Claudia Conforti, Vasari Architetto (Milan: Electa, 1993); Leon Satkowski, Giorgio Vasari: Architect and Courtier (Princeton: Princeton University Press, 1993) and idem, Studies on Vasari’s Architecture (New York: Garland, 1979).4. The Siege of Florence, a fresco executed in the Ducal Palace in 1560 under the direction of Giorgio Vasari, meticulously recorded the topography of the city, including the demolition ordered by Cosimo I to facilitate the creation of the Strada Nuova. ordering the simple disposition of the magistracies along the two sides of the Strada Nuova, a new street that he opened in 1546 to connect the Piazza della Signoria to the bank of the Arno. Definitively named chief architect of the state in 1560, Vasari elaborated a project that was a direct result of its particular urban conditions and was characterized by an irregular rectangular plot measuring 147 metres long and 76 metres wide that was shaped by several important preexisting structures: the Loggia dei Lanzi and the Mint at the north-west end, and S. Pier Scheraggio at the north-east end. 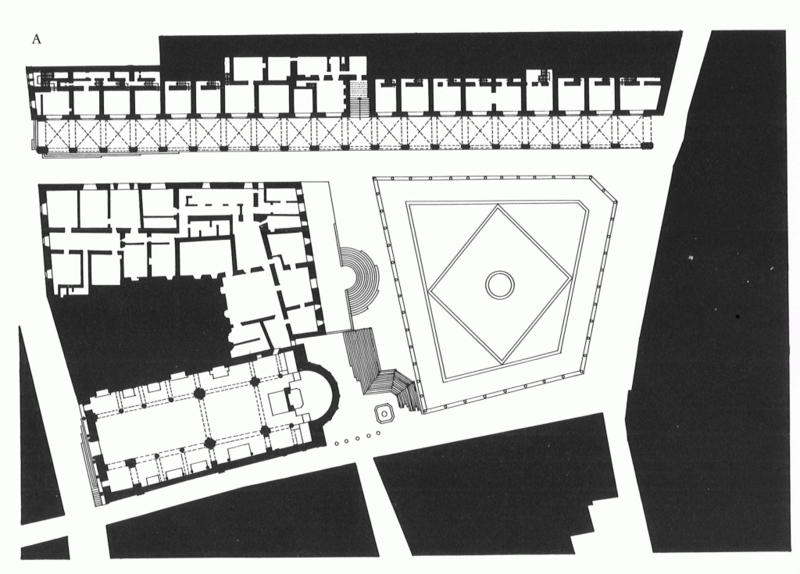 Deeply influenced by the iterative modularity of the mediaeval Procuratie Vecchie in Venice, but even more by the longitudinal tension of Michelangelo’s Laurentian Library, Vasari’s final solution, a three-storey building arranged in two symmetrical but unequal wings, turned the Strada Nuova into an hybrid, open public courtyard, a perspectivally oriented “stage” set between the absolute volume of the Ducal Palace, with its “choral” group of statues by Michelangelo, Bandinelli and Ammannati, and the private residences of the ducal court across the Arno, including the Palazzo Pitti, the Boboli gardens and the Forte Belvedere. In this way, the “bureaucratic machine” of the Uffizi completed Cosimo’s renovatio by providing a concrete visual infrastructure that connected and distributed the loci of power around its longitudinally oriented piazza, just as Bramante’s Belvedere for Julius II or even Caesar and Nerva’s Roman Fora had done.5. The system would be implemented with the construction of the corridor for the ceremony of the marriage between Cosimo’s son, Francesco I, and Joanna of Austria in 1565. 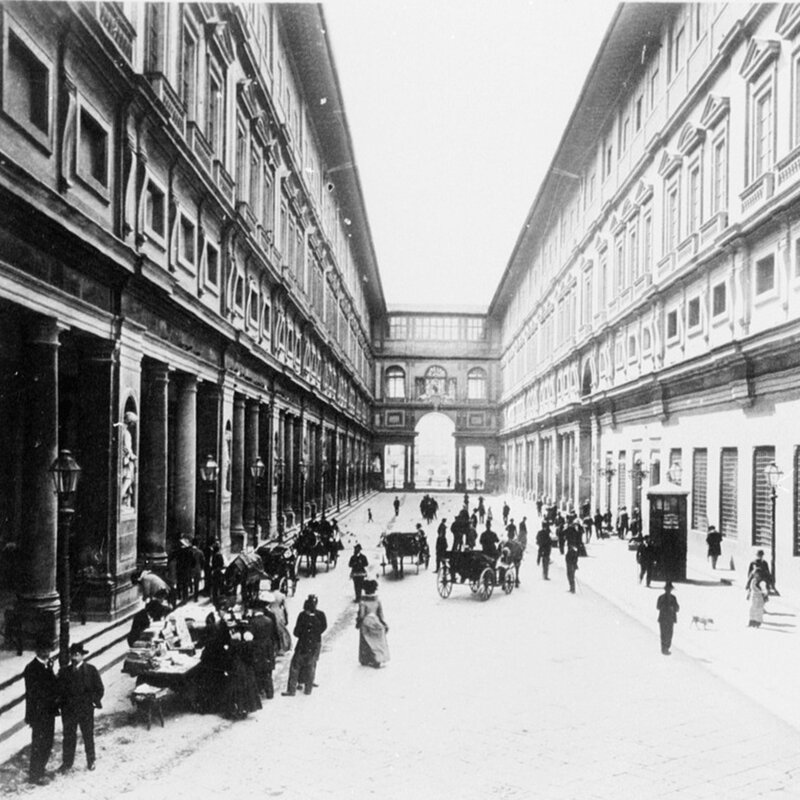 The Corridore was a half-kilometre-long suspended, covered street running from the Palazzo Ducale, through the Uffizi, over the Ponte Vecchio to the Palazzo Pitti: by camouflaging itself within the existing urban fabric, it allowed secret and safe movement between the buildings of the court. In order to accommodate the all eight magistracies and the five guilds, despite their varying importance and functions, Vasari designed a modular volumetric unit that could be easily halved or doubled according to the occupants’ needs. This sort of “typical plan” comprised an almost cubic, double-height audience chamber that was directly accessible from the continuous external porticoes and furnished with benches and a fireplace. There were also three service spaces at the back for secretarial activities and storing records, as well as a deposit area on the mezzanine level that was accessible from a side staircase. The tripartition of the module was rationally repeated in elevation as well, for it was marked by pronounced cornices that divided the upper and lower loggias from the piano nobile, with its large series of windows in alternately triangular or arched tympani that provided light to the ducal workshops and laboratories. Arezzo, Loggia. Ground Floor plan. The basement floor was organized with a radically abstract trabeated loggia, which displayed Tuscan-Doric columns to praise the mythical Etruscan/Tuscan origin of Florence’s power, and was covered with a longitudinal barrel vault lightened by low rectangular openings, as found in Roman crypto-porticoes. The disarticulation of the façade from the internal distribution of the modules allowed the perfect integration of an incredible variety of programmes (including a church, a theatre, a library, a mint, an art gallery, a mediaeval tower, warehouses and, of course, offices) despite the site’s irregularities, literally transforming the building into a “product” of its context – a city within a city. By making the modern administrative centre of the capital city coincide with an open void, Vasari interiorized the public space of the Strada Nuova as the propelling core of the whole Grand Duchy, clearly marking the shift from a power imposed through military force to a power exerted more abstractly through management, i.e., through taxes, legislative decrees, financial strategies and obedient armies of functionaries. As an expression of the emergent state bureaucracy, the Uffizi’s severe architecture not only anticipated the formulaic repetitions of the 17th- and 18th-century apparatuses of governance, but also constituted, through its reversal of the figure–ground logic of traditional architectural “objecthood”,6. Colin Rowe and F. Koetter, “Crisis of the Object: Predicament of Texture”, in Collage City (Cambridge, Mass. : The MIT Press, 1978). one of the most important paradigms for modern spaces of immaterial production, from the urban arcades of the 19th century to contemporary office landscapes. An office is what it does. It is a praxis that coincides with its own effectuality, an operation that defines itself and its agents only by being performed: it resembles a behaviour more than a thing. It does not refer to specific subjects or end-products; rather, it depends upon the conditions in which it is placed. In other words, its “content” coincides with its “context”. By simplifying the plan and reducing it to a series of hollow volumetric modules and thereby creating a permeable, generic structure embracing a civic space, the Uffizi precisely entailed this conceptual evolution of the office “as space” – a rigidly circumscribed productive domain – into the office “as service” – an action that is based on its embedded operativity and can be performed in a broader field of application. This “service” or “action” is simply supported by a flexible, uncluttered layout devoid of obstructions: a pure and clear frame for the human theatre of production in the foreground. As recently pointed out by Giorgio Agamben, the Latin term officium was traditionally linked to the verb efficere, meaning “to work out, to make efficacious, effective”, rather than to opificium, or the proper “production of an opus, a work”. The difference is not irrelevant. The intrinsic operativity of the former, in fact, coincides with neither the “acting” nor the “doing” of the latter, but with the particular idea of “sustaining, administering, conducing” (gerere) or “conveying something to effect” (aliquid ad effectum adducere).7. Agamben investigates the origin of the concept of the “officium” and its theological development by way of the term of “liturgy” (from the Greek leitourghia, comprised of laos, or people, and ergon, or work) or the Christian ministerial public cult that realizes the effectuality of the Opus Dei. In the liturgy, the priest’s identity is defined by the act he is performing and, vice versa, the liturgical act could only exist thanks to the role of the priest: the liturgy or sacraments are never re-presented, but always “presented” in their effectuality. Therefore, in both the civil and holy officia, the agents and their actions were mutually blurred within a unique duty: the priest, as the functionary, was both an “animated instrument” of a superior power and a subject individualized by his single performance. See Agamben, Opus Dei: Archeologia dell’ufficio, vol. II.5 of Homo Sacer series (Turin: Bollati Boringhieri, 2012), but also its recent review by Antonio Negri, “Il sacro dilemma dell’inoperoso”, Il Manifesto (24 February 2012), and Augusto Illuminati, “Opus Dei o Opus incertum?”, available online at www.lumproject.org. 8. Cicero, De Officiis, bk. I, 7–8. This explains why Cicero employed the term officium in his De Officiis as the translation of the Stoic principle of katechon, meaning “what is convenient to be done according to circumstances”. The Stoics, in fact, distinguished two kinds of actions: some accomplished an absolute and perfect rectitude (katorthoma) in relation to undeniable values such as wisdom, temperance or justice, while others indicated relative “neutral” deeds (katechonta) that had to be deduced from the contingencies within which they were applied, such as “talking”, “posing questions” or “going for a walk”. Cicero defined this second class as a commune officium, because it was essential to generic human nature: it is what makes life governable, what truly “institutes” and “shapes” the human condition, while animals merely adapt to their surroundings through instinct. But the “ministry” of he who administers, governs or command is a form of performance of a charge that is not productive per se, in the sense that it does not “make anything”. If the action refers to an end-in-itself, and the deed to an end-beyond-itself, the idea of management does not have any end-product besides its mere effectuality: the office is an “activity without work”. Therefore, the “office” should be conceived more as a relationship in which the subject and its action are drastically separated and intimately connected simultaneously, and whose intrinsic operativity, beyond questions of good and evil, connects its acting subject with a function that is not really ascribable to him. As in the very act of imperium, whereby the impersonality of the norm is always exterior and accepts anything and everything because it merely “relates” and “accomplishes”, the office gradually becomes an apparatus whose actualization becomes effective only when it subsumes and organizes subjects and deeds, interconnecting who acts and what is executed – being and praxis, what the man is and what he does – with a uniquely indistinct and singular circularity. On the other hand, in order to become actual, or to pass from possibility to concrete reality, an office always requires the virtue of human agency, wherein “virtue” is intended as the human predisposition to confront and react to the unpredictable, dynamic situations of reality by actualizing its own potential capabilities, its inner labour power.9. According to Karl Marx, “By labour-power or capacity for labour is to be understood the aggregate of those mental and physical capabilities existing in a human being, which he exercises whenever he produces a use-value of any description.”, and elsewhere he states that “the use value which the worker has to offer to the capitalist, which he has to offer to others in general, is not materialised in a product, does not exist apart from him at all, [and] thus exists not really, but only in potentiality, as his capacity”. See Marx, Das Kapital: Kritik der politischen Ökonomie ; the English translation consulted here is Capital: A Critique of Political Economy, vol. 1, bks. 6–7, online in the Marx/Engels Internet Archive, www.marxists.org (last consulted 9 April 2012). Here the term virtue, from the Latin virtus, which is derived from vir, or “man”, and vis, or “force”, is intended to signify the human ability to control his natural faculties, or his ability to project and accomplish his intentions, thoughts and actions, and modulate them according to the circumstances. 10. In the vast literature on Niccolò Machiavelli and the relationship between fortuna and virtù, see Roberto Esposito, Pensiero vivente: Origine e attualità della filosofia italiana (Turin: Einaudi, 2010). 11. As Paolo Virno has remarked, in the domain of cognitive capitalism not only has the concept of virtue become the most profitable expression of labour-power, but the whole sphere of immaterial production has also gradually assumed the same exteriority of the virtuous political action. Labour continuously demands higher levels of virtuosity, namely, the capacity to perform and communicate with others, the ability to improvise, vary and improve the generic human intellectual faculties and the dexterity of speaking multiple languages, articulating discourses and formulating innovative assumptions beyond customary uses or trends. See Paolo Virno, “Virtuosismo e Rivoluzione”, Luogo comune, no. 4 (1993); this was also published in English as “Virtuosity and Revolution: The Political Theory of Exodus”, in Radical Thought in Italy: A Potential Politics, ed. Paolo Virno and Michael Hardt (Minneapolis: University of Minnesota Press, 1996). As in a vicious circle, the office “domesticates” this virtue by turning it into an habitus, a custom, an acquired behaviour, while the virtue improves the operativity of the office itself by extending the latter’s range of application through the ceaseless accumulation of experiences, knowledge and all of the other unexpressed and alternative “possibilities”. If the office is a way of governing life, then the virtue of human agency is what allows it to become a constituent practice. As Niccolò Machiavelli put it, it is precisely the externality of the virtue and its arbitrary encounters with fortune that permit the profitable performance of government and management. Rather than perceiving the virtue as being a question of pure moral integrity and fortune as the “turbulent river” inundating all human organizations, Machiavelli conceived virtuosity as the one and only instrument capable of turning the capricious uncertainty of the context into nourishment for political power and a spark for igniting human potential. In this sense, both the office as “activity without work” and virtuosity as “performance of the subject” progressively became the two complementary paradigms informing immaterial production – expressions of a cognitive labour that ever increasingly assumed the forms of a political action requiring an audience, an organized space, a social dimension, a context. Therefore, if the office was traditionally conceived as a hierarchical structure of well-compartmentalized dominions, it later supported and reproduced itself only thanks to the amount of variety it was able to process and homogeneously organize. In order to enlarge its field of subsumption, since the Renaissance it has progressively reduced its constraints and abstracted its spatial structures in series of “typical plans”, becoming a neutral diagram of control capable of turning possibilities into measurable facts, of neutralizing conflicts within established compromises, of fusing dynamic war-machines with bureaucratic apparatuses. The Loggia in Arezzo constituted a first step in this gradual abstraction of the office space as a conceptual completion of the Uffizi, an attempt to unfold and extend that structure’s particular relationship with a public street in a wider open civic space. Conceived as a financial outpost of Florence’s administration, the Loggia was almost an appendage of the nearby Medicean fortress built by Antonio da Sangallo il Giovane. 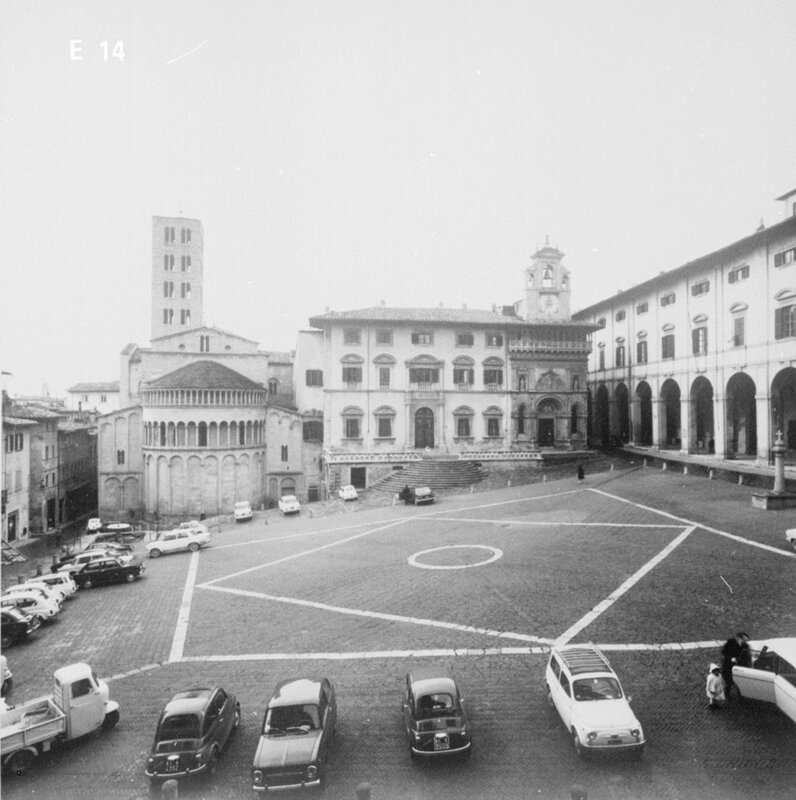 It was designed to control commercial exchange with the provinces along the south-east border of the Grand Duchy and to provide a subtle infrastructural space for the productive activities taking place in the Piazza Grande.12. Cosimo was extremely rude to the Aretines. To subjugate their freedom, and to tame their wild opposition, he first demolished the mediaeval Palazzo Comunale and the 11th-century Duomo Vecchio, the city’s two greatest “civil and spiritual” monuments, and then later commissioned a new fortress and a new administrative centre in order to replace the local authorities with a class of subordinate functionaries. Therefore, the Loggia had a crucial political relevance. On the one hand, Cosimo used it to install the Chancellery of the Nove Conservatori del Dominio, in order to reinforce his control on Arezzo and its financial affairs, while on the other, the Aretines used the Loggia to attract the attention of the central government and to exploit Florence’s economic resources in order to rebuild the damaged urban fabric surrounding the Piazza Grande. The Loggia primarily comprised a number of workshops, offices and rental houses: it was a sort of “hotel” in which living and working activities coexisted within the same building complex. On the ground floor, there were workshops and stores similar to Roman tabernae and stalls for moneychangers, all organized along a series of twenty arcades, while on the upper level there were offices for the Monte di Pietà (a sort of municipal loan bank), the Chancellery of the Nove Conservatori del Dominio (instituted by Cosimo to supervise the relationship between the capital and the Medicean domains) and the Customs House, as well as several apartments to be rented to either state functionaries or wealthy tenants. If the Loggia recalled the Roman basilica – particularly Cesariano’s reconstruction of the Vitruvian Basilica in Fano with its attic extension – in its typological and programmatic features, structurally it resembled slightly earlier buildings, such as Vignola’s Portico dei Banchi in Bologna or Falconetto’s Monte di Pietà in Pauda. The Loggia regularized the northern edge of the square with its continuous slab, measuring 126 metres long and 19 metres wide, thereby ingeniously responding to the complex topography of the site without compromising the overall equilibrium of the city’s historical urban fabric. The severe simplicity of the façade, which is devoid of architectural orders and only “drawn” by the lines of the sandstone cornices, gave the building the character of an urban backdrop whose recessed linear flatness emphasized the preexisting volumetric masses of the Palazzetto della Fraternita dei Laici and the apse of Santa Maria della Pieve. Once again, Vasari “reversed” the traditional design procedure, conceiving the office building as a direct articulation of its constituent surrounding conditions rather than a volumetric imposition of an autonomous architectural object. But even more, in the Loggia Vasari literally reduced architecture to a “potentially endless set of pieces”13. The “potentially endless set of pieces” is part of the “abridged list of stimulants, a-temporal and necessarily transcultural” objet trouvés presented by Colin Rowe and F. Koetter in the “Excursus” with which they conclude their book Collage City (Cambridge, Mass. : The MIT Press, 1978). whose conceptual contiguity with the Greek stoa, the Roman Porticus Aemilia or even the substructures of the Villa a Poggio a Caiano he had already put to the test in the linear supporting arcades for the Corridore running along the Arno. As it had in the Uffizi, this “mechanical logic” allowed Vasari to epitomize the whole project in a single repeated structural module, which was given expression in the form of a wooden maquette displaying two of the Loggia’s bays. Since Vasari supervised entire project’s construction while far from Arezzo, the model was sent to Alfonso Parigi the Elder, the building-site supervisor, in order to ensure that the main proportional relations of the façade would be respected. In a way, Vasari’s “managerial” approach and his professional detachment from the construction site could be conceived as consequences of his progressive understanding of the technical drawing, the disegno,14. Among the various academies established by Cosimo I de’ Medici, one of the most relevant, the Accademia delle Arti del Disegno, was founded in 1563 and directed by Vasari. as an autonomous expression of the human intellect, or as a pure formalization of abstract ideas imagined and fabricated within the individual’s mind. Design, being naturally “cognizant of the proportion of the whole to the parts and of the parts to each other and to the whole”, could be reduced to the scientific question of distribution and economy as the necessary counterparts of its material concretization, which was related to the intrinsic properties of materials and construction techniques.15. Giorgio Vasari, “Introduzione di Giorgio Vasari Pittore Aretino alle tre arti del disegno, cioè Architettura, Scultura e Pittura”, in Le Vite de’ più eccellenti pittori, scultori, ed architettori, ed. Gaetano Milanesi, (Florence: Sansoni, 1878–85), vol. I, 37–38; for the English translation, see Vasari on Technique; Being the Introduction to the Three Arts of Design, Architecture, Sculpture and Painting, Prefixed to The Lives of the Most Excellent Painters, Sculptors, and Architects, trans. Louisa S. Maclehose, ed. Gerard B. Brown (London: J. M. Dent & Company, 1907). It would be precisely this “mechanical” dissection of architecture into parts and modular units that gave rise to the later typological investigations of Vasari’s long-time collaborator, Bartolomeo Ammannati, and Vasari’s nephew, Giorgio Vasari il Giovane, within the cultural and scientific environment of the Dux Mechanicus Francesco I, son and successor of Cosimo I. Both of them collected a large “corpus” of plans, notes and drawings, envisioning hypothetical ideal cities based upon a horizontal juxtaposition of officia that were mostly intended for social and welfare services (such as schools, monasteries, hospitals, custom houses, markets, tribunals, magistracies, prisons, barns, warehouses) and whose combinatorial articulation constituted a sort of endless productive substratum that did not distinguish living from working activities.16. See Manfredo Tafuri, L’architettura del Manierismo nel Cinquecento europeo (Rome: Officina Edizioni, 1966); and Eugenio Battisti, L’Antirinascimento (Milan: Feltrinelli, 1962), 236. In this sense, Ammannati’s project for a Calonaca (a parsonage) and Vasari il Giovane’s drawings of monasteries were already conceptually contained in the plan of the Loggia, which presented no significant variations in the size of the rooms despite the fact that these were designed to perform different functions: the bay of the portico, in fact, roughly equalled the area of the storerooms on the ground floor, as well as the area of the offices and the residential spaces on the upper floor. 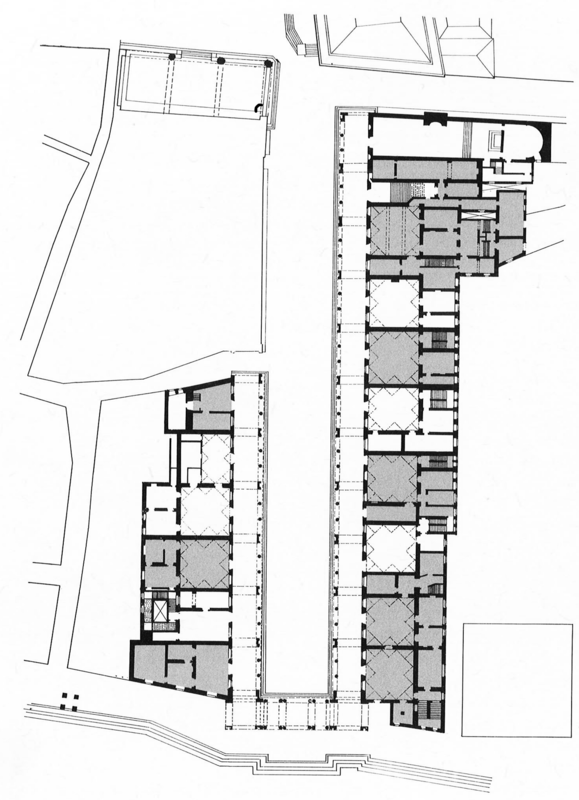 The row housing, in fact, was served by a central spine for circulation that rendered all the spaces almost equivalent by modulating the whole plan according to a structural grid with only a few exceptions, such as the “saloni”, which were vaulted while the other rooms had wooden floors and ceilings. The more the “office” fulfilled its own effectuality, the more its plan became empty, abstract and reproducible in order to prevent the limitation of its subjects’ ability to act. This “typical plan”, which not only abolished any programmatic differentiation of its interior spaces but also rhythmically framed the adjacent contextual conditions, proposed the possibility of creating an entirely homogeneous, continuous, flexible layout that was capable of making any human material or immaterial potentiality productive.